It’s almost summertime! Can you believe it? With the weather warming up, it’s time to pull out your popsicle maker and have some fun making some cool treats with the kids! 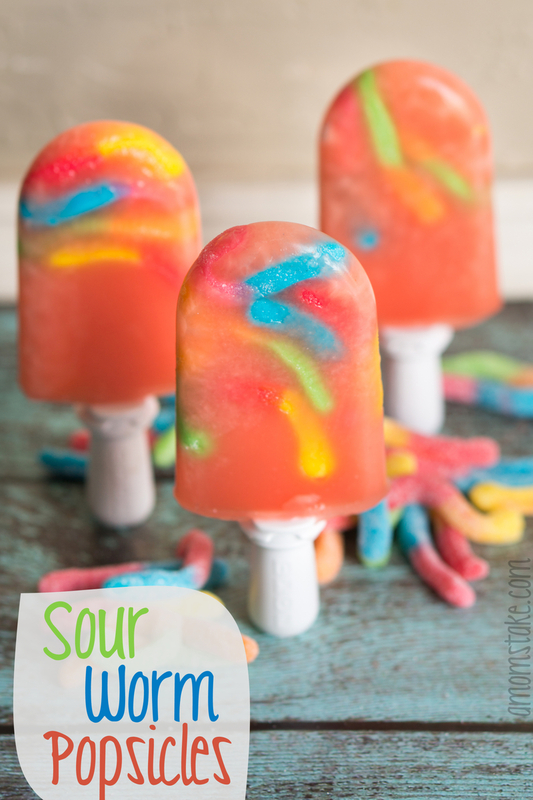 These Sour Worm Popsicles are so fruity and flavorful they will be an instant hit with the whole block! I used my Zoku popsicle maker to make these popsicles, but you can use absolutely any kind of popsicle maker. No popsicle molds? Just use miniature paper cups and popsicle sticks and you’re good to go! If using a Zoku, stick several sour gummy worms to the sides of the popsicle maker for about 30 seconds before adding your juice to the mix. In a regular popsicle mold, just add your worms to the molds first pressing them towards the bottom and sides of the popsicle cavities. If you’d like, you can stick your molds in the freezer for 10 minutes to help keep your worms in place when you add the juice layer, but it’s completely optional. After you have added your worms to your popsicle molds, pour in your juice of choice. I use Hawaii’s Own Guava Strawberry juice. It’ the kinds you can find in the frozen concentrate section. I mixed it up using a bit less water than the package calls for as I wanted a stronger fruity flavor. A fruity flavorful juice pairs perfectly with the sour worms! 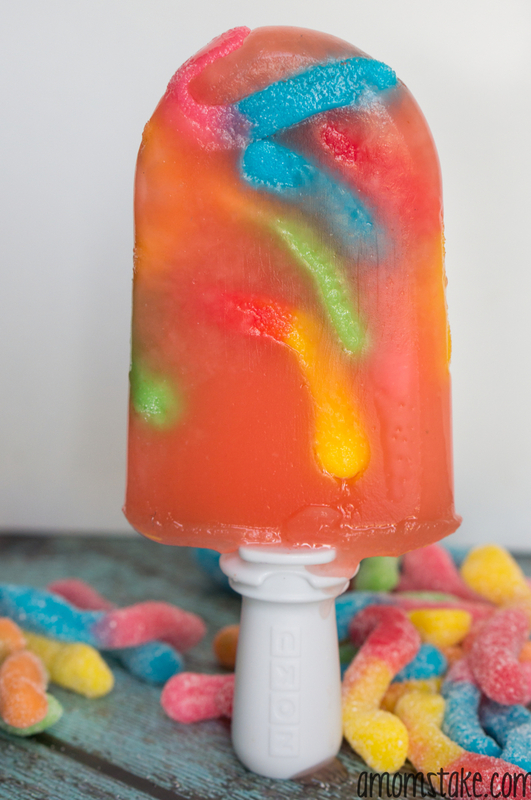 These Sour Worm popsicles will be about the most fun popsicles you’ll taste all summer! They were an instant hit in my house and even I kept saying “mmmm” and “Yum! !” every bite I took! 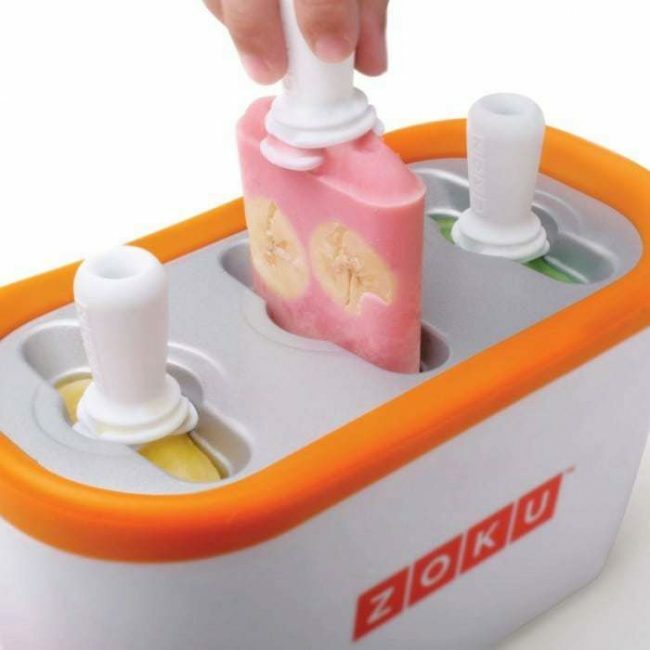 Keep in mind, freezing the worms will turn them slightly harder, but at least in the Zoku, they’ll still be easy to chew and taste really yummy in the popsicles. Love this post? 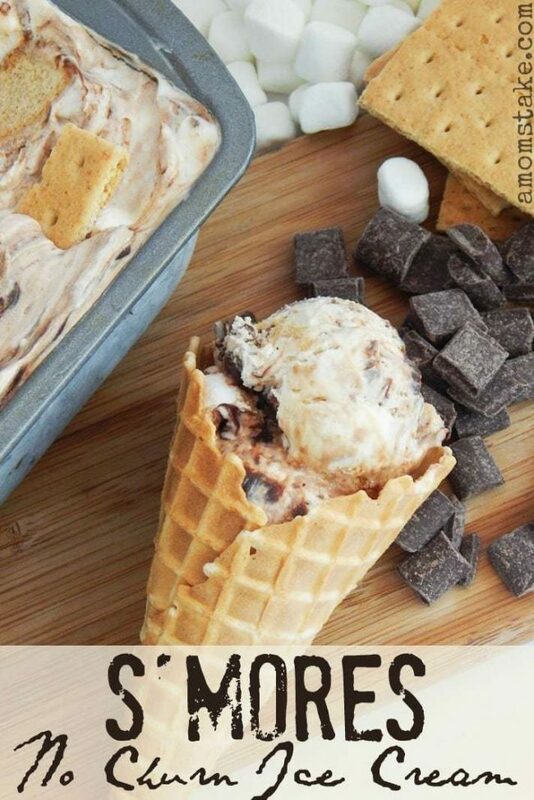 You’ve got to try our irresistible no-churn homemade S’mores Ice Cream next! Like us on Facebook for more great recipes! What’s your favorite summer popsicle? Janel, you’re so creative! LOVE this idea 🙂 Some of our nieces and nephews are coming over for a sleepover, this will be the perfect thing for me to create. Thank you for allowing this post (and so many fabulous others) as a roundup on our Summer Themed #PinUP Pin Party! Join us every Friday, a new theme every week! So cute and such a great idea!! I love the colors! This makes them even more wonderful!! I have tried freezing yogurt for something different and healthy. I love gummy candy for sure. I will have to try this for grandson and me!!! These would be a great summer treat for the family. I love gummy worms and the grandkids love them even more. Awesome recipe. these look amazing. i think the sweet and sour taste would be great. These would be a huge party hit this summer. So cool and unique. My nephew loves sour worms so he would really like these pops. Thanks for the recipe. My kids would love this they love popsicles and gummy worms and I pinned it to make later. Thanks for the idea. I love this! Pinned. Thank you for being a part of our party. I hope to see you tonight at 7 pm.. It is always a pleasure to have you! oh fun what a great idea, we love sour worms. What an adorable idea! My daughter would love these! Well my husband love sour patch kids … and one of my summer goals in my post was to make homemade popsicles… so this is about a perfect post for me! Thanks for the idea! Loved your blog post and definitely look forward to seeing future additions!! i have got to try this, this summer for my kids..
How fun! My kids would love these this summer! I was telling my 18 y/o daughter about these and she started moaning (in a good way). She loves everything sour. OMGosh! Will you be my summertime mom?! Pinned and stumbled! My grandkids would love these pops. Found your recipe at Simple Supper Tuesday. I am one of the hostesses of Tickle My Tastebuds and would love you to stop by and link up this recipe if you have not yet already. Very creative idea! I would love it if you joined and contribute your awesome posts at my link party at City of Creative Dreams, starts on Fridays 😀 Hope to see you there at City of Creative Dreams Link Party. I’m definitely pinning and then using this. My husband has been talking about wanting to go to A&W for ages and get the Sour Patch Kids milkshake Mix ins. When we finally went he was disappointed, so I will try this next :)Gotta have the sour taste! Looks like I’ve found something that’s bound to be a favourite for my kids this summer. Thanks for sharing! I can’t wait to make these for my kiddos! They will flip! Thanks for such a creative idea! These are amazing! What a great idea! Thanks for sharing on the Monday Funday Party! That sounds like a really good flavor combination. My kids would love these. I can see how those would be a great hit with the kids! I can’t do sour, but I bet they would be good with other gummies too! I know these are supposed to be for kids, but I just know that my husband would love these!! I’m totally making these awesome treats this week. I would love it if you would link this up at my Motivate Me Monday linky party! My kids would love this! It’s funny and I’m sure the sour tummies will make their faces scrunch up! These are adorable! I am not a big candy eater in general, but I looove those worms! This will be a hit with my daughter, she loves sour gummi worms! Stopping by from Bouquet of Talent Linky Party. Love the idea of adding Sour Gummy Worms, my kids would love this (Mommy too) 😉 Thanks for sharing! Stopping by from the Saturday Night Fever link up. I love everything about these! I have a Zoku Popsicle Maker I have never used and these would be perfect to try out for my grandchildren. I know they would just love them. This is so neat…Im going to make these. Too cool! My kids would be all over this! We are going to make them this weekend! Super cute idea. Ibet this is a big hit with kids! My kids love sour worms, and they would freak out to put them in a popsicle. This is genius! My nieces would enjoy making these since it’s so hot here. Thanks for sharing this idea. Lol, there was no way I was sharing mine! They turned out so good. They are super easy to make, you shouldn’t have a problem no matter your popsicle forms. Ok, this gummi worm popsicle idea totally made me laugh, but I think the kids at our family reunion will love it. I’m pinning it now. thanks!